We are delighted that three long-time NIGMS grantees have been recognized by the 2018 Lasker Awards . The awards highlight fundamental biological discoveries to draw attention to the importance of public support of science. Michael Grunstein of the University of California, Los Angeles, and C. David Allis of Rockefeller University, received the 2018 Albert Lasker Basic Medical Research Award for “discoveries elucidating how gene expression is influenced by chemical modifications of histones—the proteins that package DNA within chromosomes.” NIGMS funded Grunstein’s work on the establishment and spreading of silent chromatin from 1977 to 2012. His research led to the generation of the first histone mutations in yeast and the first demonstration that chemical modification of specific ends of histones could turn gene expression on or off. Allis identified and characterized enzymes that add, remove, and read histone modifications. His work led to the hypothesis of a histone code that, when mis-read, can lead to disease. NIGMS has funded Allis since 1988. Joan Argetsinger Steitz of Yale University received the 2018 Lasker-Koshland Special Achievement Award in Medical Science for “four decades of leadership in biomedical science—exemplified by pioneering discoveries in RNA biology, generous mentorship of budding scientists, and vigorous and passionate support of women in science.” Steitz’s pioneering research helped reveal the function of small pieces of RNA that are not used for making proteins. These molecules, including small nuclear ribonucleoproteins (snRNPs), help regulate gene activity. In doing so, they—like histone modifications—have a major impact on health and disease. NIGMS funded her research from 1975 to 2014. The Lasker-Koshland Award further recognizes Steitz’s long record of mentoring the next generation of scientific leaders and her effective and tireless work as an advocate for women in science. We congratulate all of the recipients on these well-deserved honors. We recently analyzed the educational and career outcomes of scholars who participated in the NIGMS Postbaccalaureate Research Education Program (PREP). The goal of this program, which we started in 2000, is to prepare recent baccalaureate graduates from groups that are underrepresented in the biomedical sciences for entry into—and completion of—rigorous Ph.D. training programs. PREP is part of a larger effort at NIGMS to support the development of a highly skilled, creative and diverse biomedical research workforce. PREP grants are awarded to research-intensive institutions. Each grant supports five to 10 scholars who spend 75 percent of their time as apprentice scientists pursuing a mentored discovery research project and the remainder engaged in academic and professional development activities. These include a program of study to enhance their academic record and workshops to improve their writing and presentation skills. Our assessment of PREP outcomes is based on various educational and career metrics for PREP scholars supported from 2001 to 2014 through 41 institutional programs. For more details about the analysis, read the report. 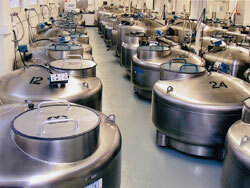 Cryogenic tanks filled with liquid nitrogen and millions of vials of frozen cells. Credit: Coriell Institute for Medical Research. Specimens from individuals with inherited diseases, apparently healthy individuals and those of diverse geographic origins that are divided equally between those from males and those from females. A group of 39 induced pluripotent stem (iPS) cell lines that carry disease gene mutations or that are normal control iPS cell lines. An inherited disease collection that represents almost 900 disorders. Last year, 1,500 scientists received more than 5,000 cell lines and 40,000 DNA samples. I encourage you to peruse the catalog and consider whether these specimens may be useful in your research program. As we told you in an earlier post, NIGMS turns 50 this year. One of the ways we’re marking this milestone is by sponsoring speakers or symposia at a number of scientific society meetings. If you’ll be at one of these meetings, please come to our sponsored session to hear from our grantees and meet some of our staff. Also, please acknowledge NIGMS funding support during your meeting talks and poster presentations, and feel free to use one of our 50th anniversary logos for this purpose. To highlight our commitment to training, we’re also sponsoring student or postdoctoral fellow poster awards at a number of these events. We’ll invite poster award winners to present their work at the NIGMS 50th anniversary symposium at NIH on October 17. Stay tuned for details about that event in a future post. Michael is a geneticist who handles grants in the areas of RNA processing, protein synthesis, mRNA metabolism and translational control, and regulatory RNAs as well as grants for the Postbaccalaureate Research Education Program. He also oversees the NIGMS Human Genetic Cell Repository.